Coordinates: 55°45′00″N 37°36′57″E﻿ / ﻿55.75°N 37.6158°E﻿ / 55.75; 37.6158 The Grand Kremlin Palace (Большой Кремлёвский дворец; Bolshoy Kremlyovskiy Dvorets), also translated Great Kremlin Palace, was built from 1837 to 1849 in Moscow, Russia on the site of the estate of the Grand Princes, which had been established in the 14th century on Borovitsky Hill. Designed by a team of architects under the management of Konstantin Thon, it was intended to emphasise the greatness of Russian autocracy. Konstantin Thon was also the architect of the Kremlin Armoury and the Cathedral of Christ the Savior. Its five reception halls (Georgievsky, Vladimirsky, Aleksandrovsky, Andreyevsky, and Ekaterininsky) are named for orders of the Russian Empire: the Orders of St. George, Vladimir, Alexander, Andrew, and Catherine. Georgievsky Hall is used today for state and diplomatic receptions and official ceremonies. International treaties are signed at the Vladimirsky Hall. It also leads to the Palace of Facets, Tsarina's Golden Chamber, Terem Palace, the Winter Palace, and the Palace of Congresses. Aleksandrovsky Hall and Andreyevsky Hall were combined in Soviet times to be used for meetings and conferences of the Supreme Soviet of the USSR; they were lavishly restored in accordance with Thon's designs in the 1990s. Currently it is the official residence of the President of the Russian Federation though it is rarely used for this purpose. During the Soviet times, the Grand Kremlin Palace had "СССР" embedded in between the upper arches of the palace, but was removed as part of the decommunization process. ^ "About The Grand Kremlin Palace in Moscow [En]". 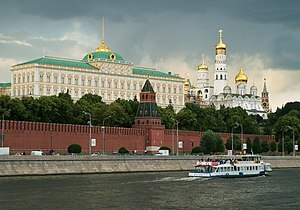 Wikimedia Commons has media related to Grand Kremlin Palace.